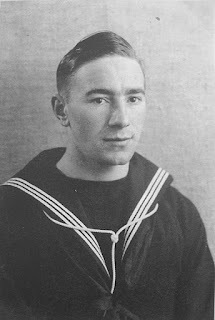 WW2 - The Second World War: Able Seaman Lancelot Thomas Bell, R.N. Most of the details in this section, and the portrait of Lancelot T. Bell seen above is based on information supplied by Mr Bob Jopling of the St Bees Local History Society. Lancelot Thomas Bell was born in 1917, the son of George Bell and Margaret T. Bell (nee Armstrong) of St Bees, Cumberland (now Cumbria). Lancelot, or 'Lant' as he was often called, was born at the Oddfellow's Arms, St Bees where his grandfather was the landlord. His father, George Bell, was a stone-planing machinist. 'Lant' was named after his uncle who was killed in action during the Gallipoli campaign (Dardanelles) in 1915 [see (c) & (d) below]. On Friday 20 April 1917 'Lant' was baptised at St Bees Parish Church. His pre-war occupation was as a coach trimmer and upholsterer for the local bus company. 'Lant' was also a keen motorcyclist and his family still has a photograph of him proudly showing off his new motorcycle (registration number EGK 282). At the outbreak of WW2 'Lant' Bell was living at 1 Croft Foot, St Bees. On Sunday 31 March 1940 - the Sunday after Easter Day - Lancelot Thomas Bell was married by licence to Miss Elizabeth Hinchcliffe Birkett at St Peter's Parish Church, Kells, Whitehaven, Cumberland. The ceremony was performed by the vicar, Reverend Henry George ('Harry') Green. The witnesses were J. Wallace and Edith Tubman. Elizabeth lived at 20 Snaefell Terrace, Seacliffe, Whitehaven which is within the ecclesiastical parish of St Peter's (Church of England). At the time of their wedding, Lancelot Bell was 22 years old and Elizabeth Birkett was 21 years old. In March 1940 St Peter's was a relatively new church. The foundation stone was laid in 1938 and dedicated on Wednesday 6 September 1939 by the Bishop of Carlisle, the Rt. Rev. Henry Herbert Williams. The British Prime Minister Neville Chamberlain had broadcast that Britain was at war with Germany on the previous Sunday, 3 September 1939. 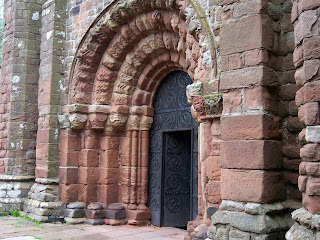 Lancelot and Elizabeth's wedding was one of the earliest to take place place in the new church (No 19 in the register). 'Lant' Bell went on to join the Royal Navy, with his next of kin now being his wife Elizabeth still living at Whitehaven. In January 1942 Able Seaman Lancelot Bell was with HMS President III (attached to the tanker M.V. Empire Gem). The "Empire Gem" had been built by Harland and Wolff less than a year earlier. She was owned by the British Tanker Company. On 24 January 192 she was on a course from Port Arthur, Texas, to Halifax, Nova Scotia. From Halifax, "Empire Gem" would have joined a convoy to the UK. Her cargo was almost 11,000 tons of petroleum spirit. Close to the coast of North Carolina, "Empire Gem" was on a zig-zag course and about to overtake the bulk-ore carrier "Venore" when intercepted by the German U-boat U-66. The inevitable torpedo from U-66 hit "Empire Gem" near the stern, igniting the cargo of petrol. Eventually, she capsized and sank. Only two of the crew survived. 'Lant' Bell was one of those posted as 'Missing Presumed Killed'. With "Empire Gem" sinking, U-66 turned towards the "Venore", fired its last remaining torpedo, and the "Venore" was also sunk. These two vessels were the U-66’s ninth and tenth successes. U-66 sank a further twenty-six allied vessels before it was destroyed in May 1944. Husband of Elizabeth Bell, of Whitehaven, Cumberland. 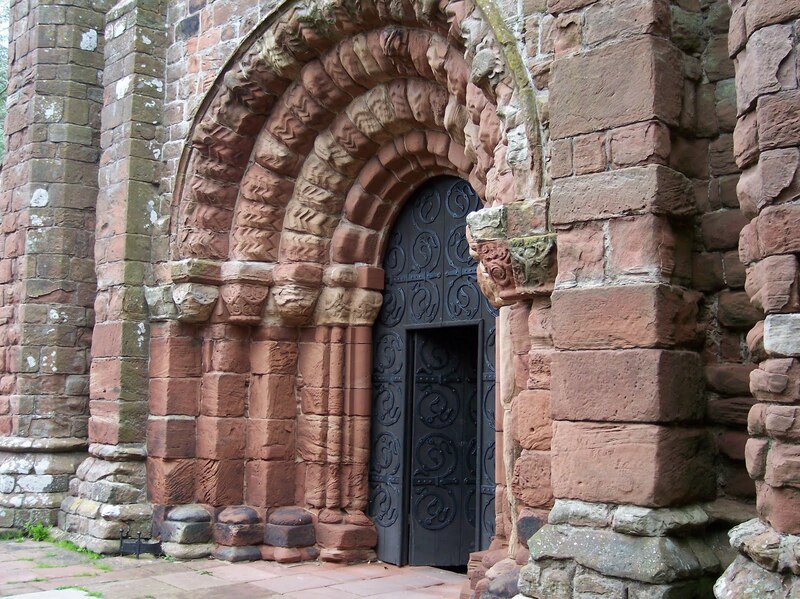 Additional information: Son of John Bell, of Pallaflat Cottages, Bigrigg, Cumberland. Grave/Memorial Reference: Panel 119 to 125 or 222 and 223. Private Lancelot T. Bell was with the 1st Battalion of the Border Regiment in the Dardanelles for only 8 days before being killed in action. He was one of a draft of 100 men reinforcing the 1st Battalion on 11 August 1915. On 17 August 1915 1st Border and the 87th Brigade of the 29th Division was withdrawn from Helles on the tip of the Gallipoli peninsula and disembarked at 'A' Beach, Suvla Bay to support the situation in that area. The Suvla Bay area and the hills to the east were in complete chaos at this time. Thus, on the night of 18 / 19 August 1915 parties from each company of 1st Border were sent forward and distributed among the Battalions of the 159th Brigade (part of General Kitchener's 'New Arny'). The 1st Border reinforcements were now in the firing line against the Turks. The trenches were found not to be in a decent state and arrangements for covering parties while the trenches were deepened were non-existent. These were the conditions which Private Lancelot Bell found when he arrived at the front. The 19 August 1915 was also to be the last day of his life. He has no known grave. By the end of the year all the Allied troops had been withdrawn from the Dardanelles. Lancelot and Elizabeth Bell's daughter (Jacqueline) was born four months after her father's death. Elizabeth carried a photograph of 'Lant' in her handbag for the rest of her life. Both the Able Seaman Lancelot Thomas Bell (WW2) and Private Lancelot Thomas Bell (WW1) are commemorated on the St Bees Parish 'Roll of Honour' (see the link given below). Able Seaman Lancelot Thomas Bell should also have been included in the Borough of Whitehaven WW2 'Roll of Honour'. However, Lancelot Bell's name was not included in the 'Book of Remembrance' despite his details being submitted to the Borough Council. In 1947, the Borough of Whitehaven began compiling the names of ex-servicemen and women who had lost their lives in the recent World War for a 'Roll of Honour'. It was also proposed to have a fund for the children whose parents had died in the war. Mrs Elizabeth Bell wrote two letters to Mr Vickerman, the Town Clerk of Whitehaven Borough Council at the time. These letters are now in the Cumbria County Archives & Library Service, Whitehaven (Ref. SMBWH 1/3/316). At the time of writing this article (November 2011), steps are being taken to prepare a more complete WW2 'Roll of Honour' for Whitehaven, Cumbria. The sacrifice of Able Seaman Lancelot Thomas Bell and his family will be remembered. Held in honour as one who served King and Country in the world war of 1939 - 1945 and gave his life to save mankind from tyranny. May his sacrifice help to bring the peace and freedom for which he died." "Let those who come after see to it that his name be not forgotten!" The details of other service casualties, as listed by the CWGC, lost with the sinking of M.V. "Empire Gem" are given below. Two of these were with the Maritime Regiment (Royal Artillery) and three with the Royal Navy. 1. Gunner Raymond C. Baker, R.A.
Unit Text: 6/3 Maritime Regt. Additional information: Son of Owen Robert and Louisa Catherine Maud Baker, of Stanford, Kent. Additional information: Son of Robert and Effie Beadle, of Southwick, Co. Durham. 1. Able Seaman Arthur H. Browne, R.N. Additional information: Son of Albert and Mary Browne, of New Barnet, Hertfordshire. 2. Able Seaman Douglas R. Griffiths, R.N. Additional information: Son of Mr. and Mrs. George Frederick Griffiths, of Ebbw Vale, Monmouthshire. 3. Able Seaman Edward C. Mullins, R.N. Grave/Memorial Reference: Panel 66, Column 1. Percy Tonge, the Donkeyman, was 57 years old when he died while one of the Apprentices, William Arthur Morris, was only 16 years old. The casualties lost on the M.V. "Empire Gem" are commemorated on three separate CWGC memorials: Chatham Naval Memorial, Plymouth Naval Memorial and the Tower Hill Memorial, London. The CWGC record for Harry Fallon and George Ferguson had been transcribed as "M.V. Empire Glen" (rather than "Gem"). This made it a little more difficult to identify the correct vessel these two seamen were serving at the time of their deaths. Much of the information supplied to the St Bees 'Roll of Honour' about the Bell family was provided by Mrs Jacqueline Black (nee Bell), the daughter of Able Seaman Lancelot Thomas Bell. I would like to thank Mrs Bell and her family for their contribution. On Remembrance Sunday, 13 November 2011, Mrs Black and her husband attended the Remembrance service at St Bees to remember the efforts of her forebears in the World Wars. "To live in the hearts of others is not to die."